Despite the mass devastation and eye-watering estimated $190 billion price tag, three GOP House members voted against the Emergency Harvey Relief Bill. 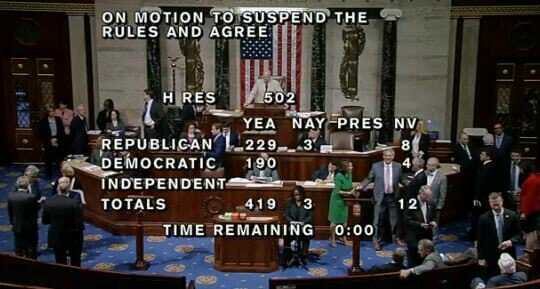 Rep. Justin Amash (R-MI), Rep. Thomas Massie (R-KY) and Rep. Andy Biggs (R-AZ) voted against the bill. The House of Representatives passed a $7.85 billion disaster aid package for Hurricane Harvey victims with overwhelming bipartisan support Wednesday, the first round of money expected for areas of Texas and Louisiana devastated by the storm. Just three “no” votes were cast in the House while 419 members voted in favor of the package. But as the bill moves to the Senate, it is quickly becoming a negotiating tool for controversial must-pass legislation. Knowing the urgency needed and the difficulty of voting against disaster relief, Republican leadership plans to attach an increase to the debt ceiling when the bill arrives in the Senate, putting conservatives who oppose lifting the borrowing limit without budgetary reforms and guarantees of reduced government spending in a difficult place: Vote against disaster relief or turn their back on principled opposition to increased government spending. As TGP previously reported Texas has begun to pick up the pieces after the historic Hurricane Harvey. More than one million vehicles may have destroyed in Hurricane Harvey. The mainstream media wants you to believe President Trump is a monster, a Russian puppet, a white supremacist — a man unfit to be leader of the free world. That’s why it was quite a shock that they would air footage of the President and First Lady greeting children at NRG stadium in Houston. President Trump hugged, kissed and even “played toys” with children impacted by the storm. It’s a side Trump voters know exists of the President, but so seldom hear about from the mainstream media.